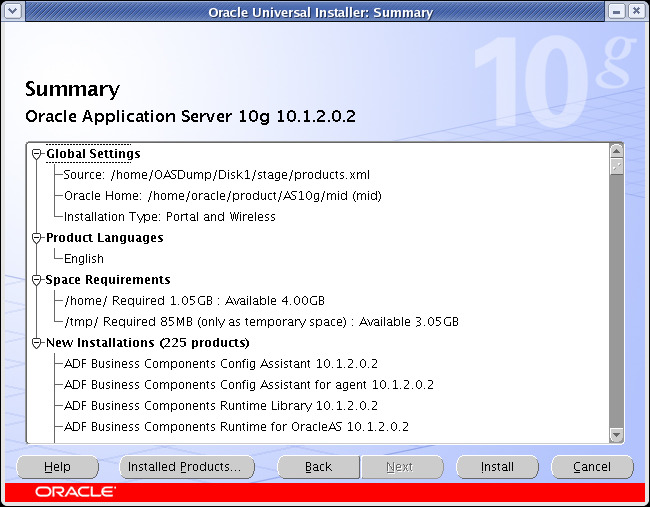 Oracle Application server 10g is a middle ware software by Oracle. Purpose of Application server is to handle the business intelligent and logic. Below is the difference between a two-tier architecture and multi-tier architecture. 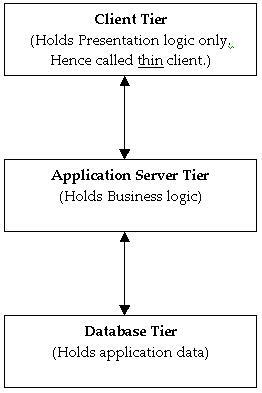 In case of a two-tier architecture we business logic and presentation is both handled by client. Hence we call it thick client. 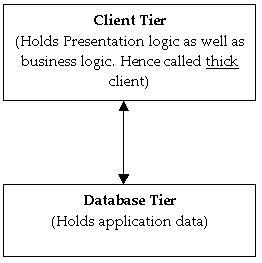 Where as in case of multi tier architecture we have only presentation layer in client side and business logic is handled by Application server. Hence such clients are called as think client. Below is the three tier architecture show. 1) In case of change in business logic the change needs to be done only in Application server (mid tier) as its centralized. Where as in case of two tier architecture ever client needs to be changed. So management is easy. 2) It reduces the network traffic, because in case of 2 tier architecture the protocol used is TCP/IP which is a stateful connection (continuous). So even if data is been send or not connection will always be there. This increases network traffic and reduces bandwidth. Where as in 3 tier architecture we have TCP/IP connection only between mid tier and database and is set when client request for some data. As soon as data is provided the connection is closed. The connection between client and mid tier is http which is a stateless connection. 3) Performance is another factor which make 3 tier architecture a better solution over 2 tier architecture. Since all business logic gets executed at client side, performance on client reduces. This is in addition to database performance issue. In case of 3 tier architecture performance is not an issue and is handled well in Application server. Below is a very simple line sketch of application server 10g component architecture. This shows what are the components that are present in AS (Application Server) and why those are required. All the above components shown above comes with AS 10g R2 installation. All these components are categorized as given below. While installing this middle tier, the installation of these components are divided into 3 main components. 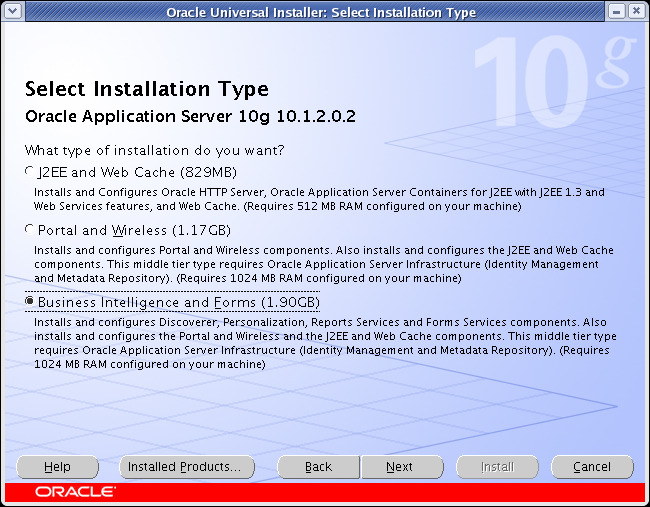 If we are installing just option 1 (J2EE and Web Cache) then infrastructure tier is not required. However we can still install infrastructure tier but in this case it wont be used by these 3 components of mid tier. If we are installing either option 2 or 3, we have to install infrastructure tier before installing these mid tier components. This is because these middle tier component such as portal and wireless will create there own repository in infrastructure’s meta data repository. So its important that we first install infrastructure tier before installing mid tier, in case we want to go for option 2 or 3 for mid tier. Out of the above components of infrastructure tier SSO, OID, DAS and OCA are together called as IDM (Identity Management). So infrastructure tier contains mainly meta data repository and identity management. Having this brief knowledge above AS 10g R2 components, lets start with installation. Before starting the installation, we should complete the pre-installation checks. This includes following steps. 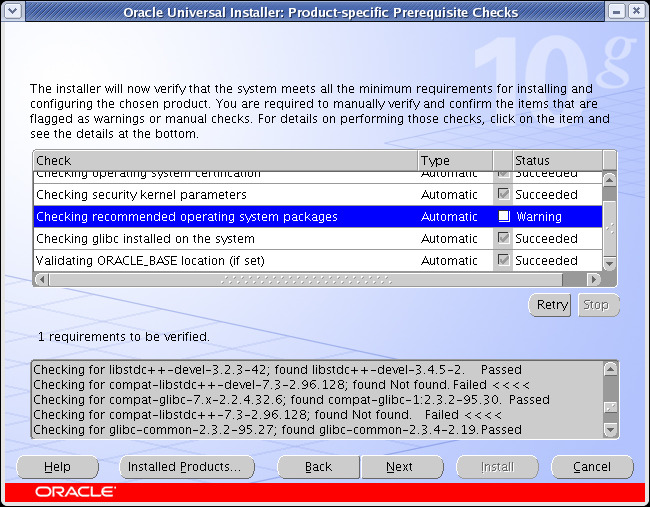 1) Check the required packages are installed in OS or not. you can check the status of package using rpm -q command. as a root user. 7) Create a group and user. 8) Make changes in /etc/hosts as root user and make following entry. The installation of AS10g should be done in specific order only as explained before. This is because of the dependencies between the components. Here we are going to install Portal and Wireless option of mid tier, this needs database repository for storing the information of these components. So we will first install infrastructure tier and then install Mid tier. Please follow the below screen shots. run the runInstaller executable present in your Disk1 directory of software dump. Screen 1 : Welcome – This is the welcome screen. Click on Next. 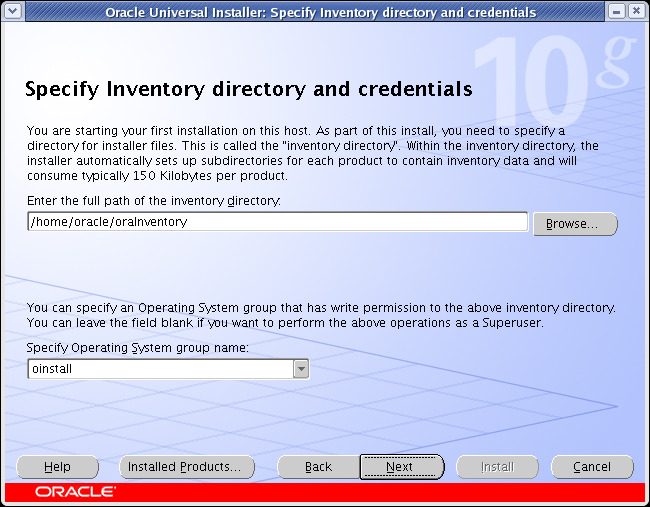 Screen 2: Specify Inventory location – In this case you can take the default inventory location and then it will ask to run orainstRoot.sh script as root user. Once you run this script as root user on that host, click on continue. 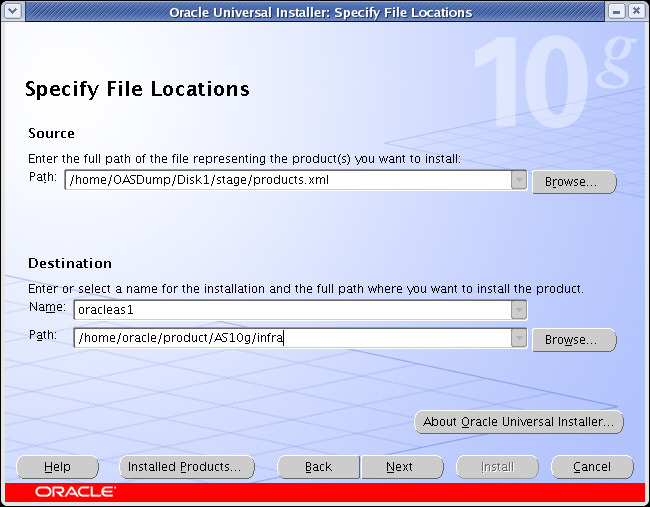 Screen 3: Specify File Locations – Specify the location of Oracle Home for Infra tier and click next. Screen 4: Select the product to Install – In this case select “Oracle Infrastructure 10g”. 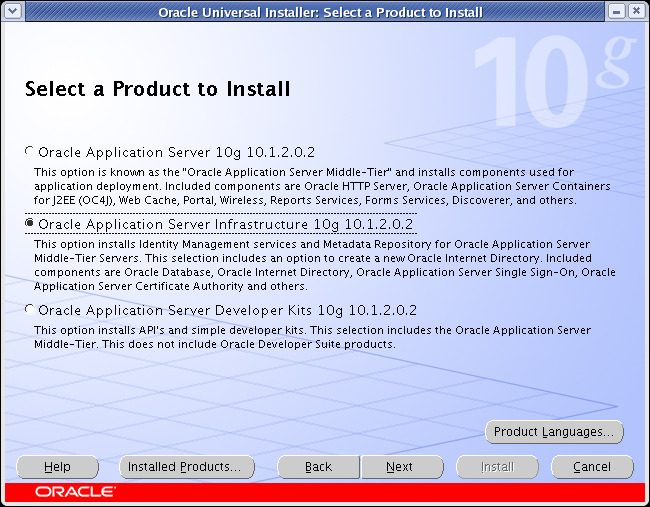 If you choose “Oracle Application Server 10g”, then it will install infra tier first and then automatically start installing mid tier. Screen 5: Select Installation type – As I said before infra tier consists of mainly IDM (Identity Management) and metadata repository. IDM consists of OID, SSO, DAS and OCA. 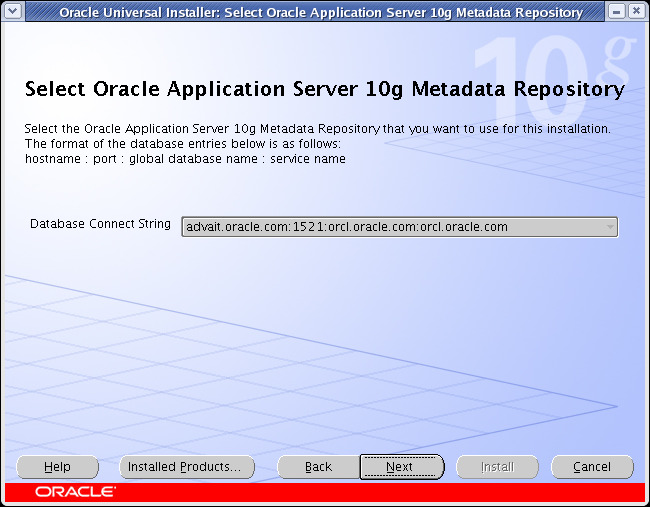 Meta data repository is a 10g oracle database. We will choose both to install here. Screen 6: runInstaller will perform the basic check on operating system. If for any of the check it generates warning, you can verify the same using the check box and then click on next. 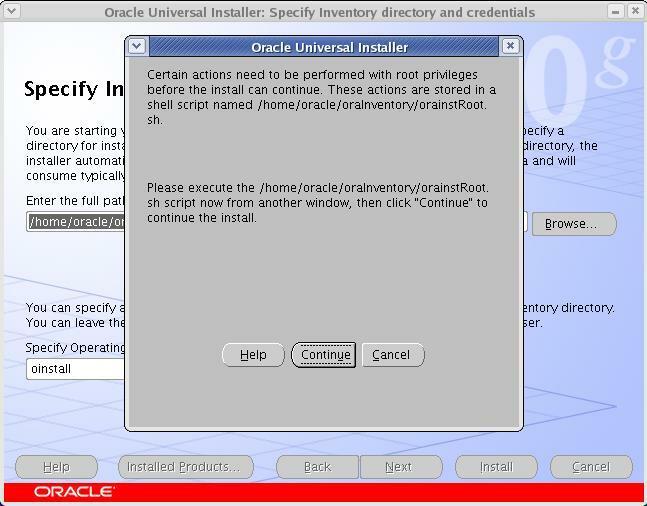 Screen 7: Pre-Installation Requirement – You should have root privileges as you need to run root.sh after installation. Select the checkbox and click on next. Screen 8: Select Configuration Option – You can select individual components which we are going to install. 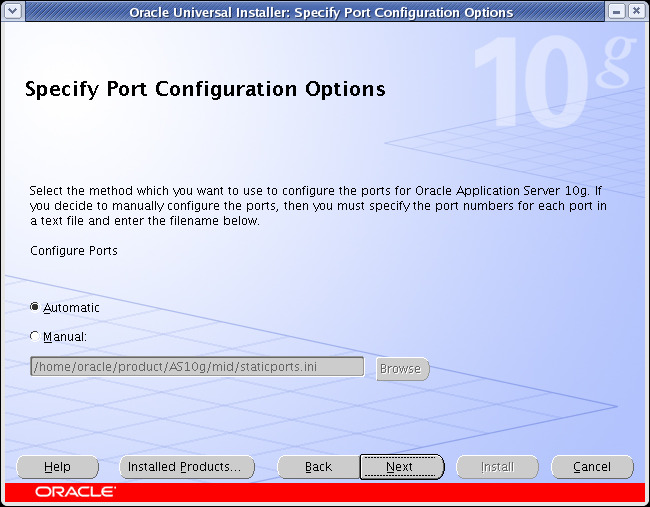 Screen 9: Port Configuration Option – For Port Configuration, select Automatic port selection to keep installation simple. Else you can specify the ports in staticports.ini file and upload the same. 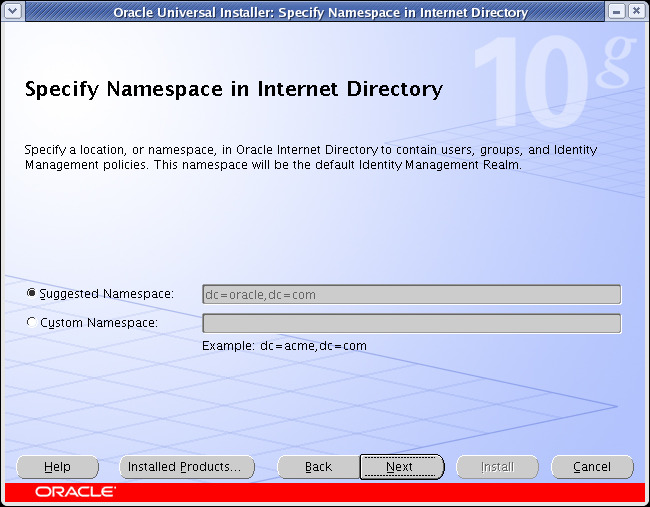 Screen 10: Namespace in Internet Directory – Select the default name space only. If your /etc/hosts name file is correct then the default port will be populated correctly. Else it may get populated as localhosts also. In that case check the entry in /etc/hosts. 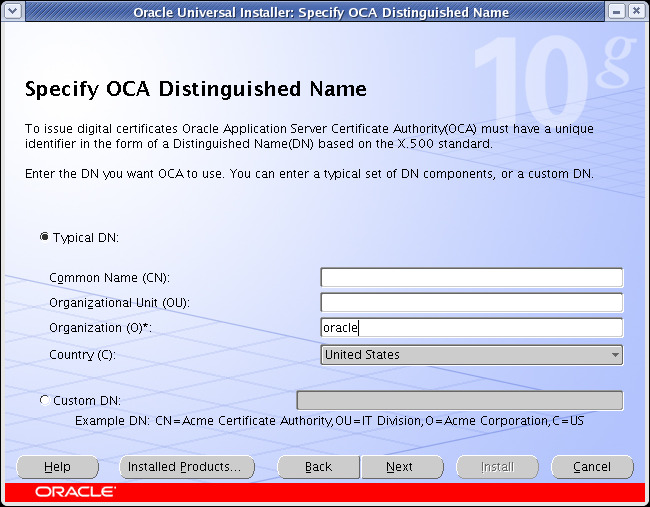 Screen 11: OCA Distinguish Name – You can specify only the mandatory fields. This is required for creating digital certificate for SSL configuration. 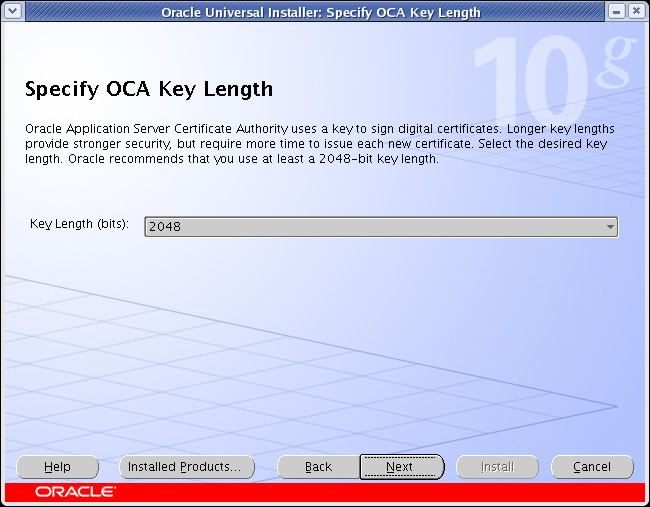 Screen 12: OCA Key length – This is the key length to be used for encryption. You can select the default 2048 and click on next. 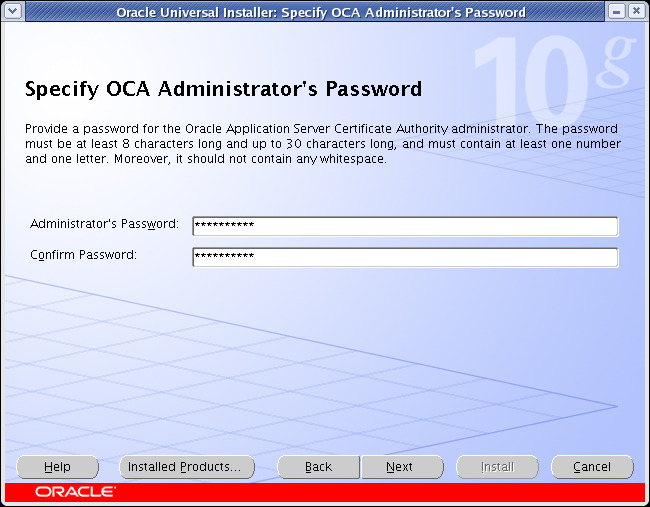 Screen 13: OCA Administrator Password – This is the password for Oracle Certificate Authority admin. Select any password, confirm the same and click on next. 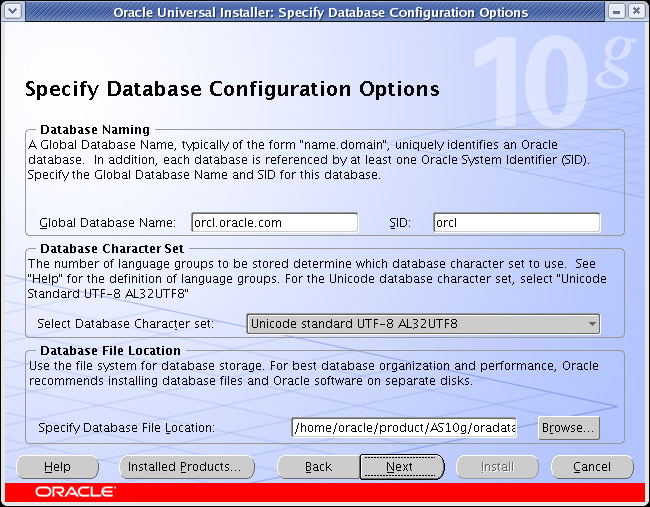 Screen 14: Database Configuration Options – Here we provide the name of the database. You can accept the default orcl or give any new name. 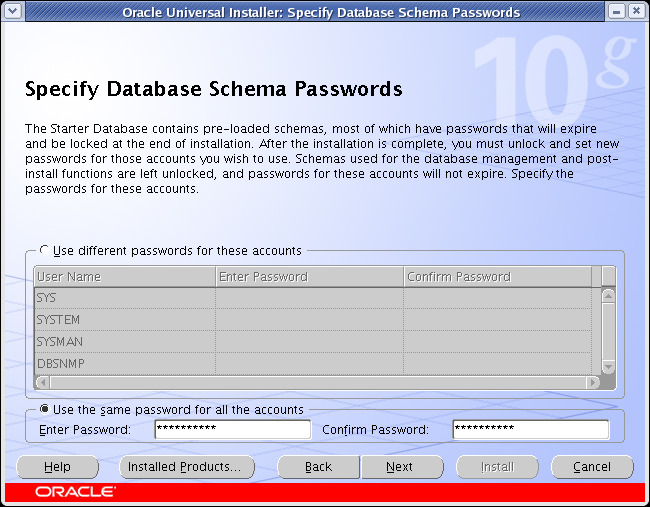 Screen 15: Database Schema Password – Select any password for database schema, confirm the same and click on next. 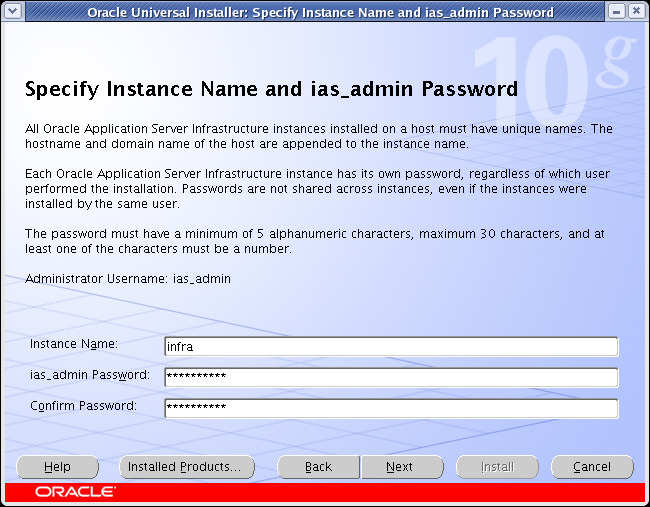 Screen 16: Instance Name and ias_admin Password – Here we are creating a new instance. Note that this is different then database instance. So for infrastructure tier you can give any name (example infra) and also password you want to use for enterprise manager. Screen 17: Installation Summary – At the end it will show installation summary. Click on Install. It will show the installation progress. Remember that it is just copying the files and will do some setup. The actual component configuration will come next. 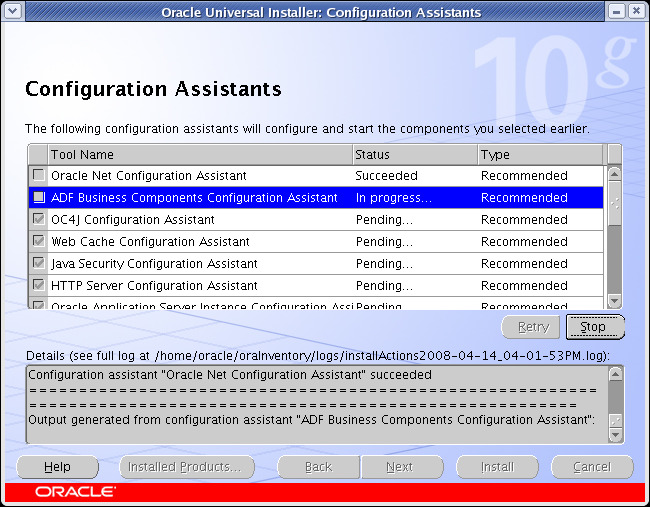 Installer has now started with component configuration. It will configure each component one by one. When it comes to Meta Data Repository, it will create a new database using DBCA. At the end of installation it will show the URLs and ports. The above URL is the URL for EM of Infra. Remember we will have 2 EM (Enterprise Manager), one for infra and one for mid-tier. With the completion of infra tier, we can now start with installation of mid tier. But note that during installation of mid tier your infrastructure tier should be up and running. run the same runInstaller executable present in your Disk1 directory of software dump which you used during infra tier installation. Screen 2: Specify File Locations – Specify the location of Oracle Home for mid tier and click next. 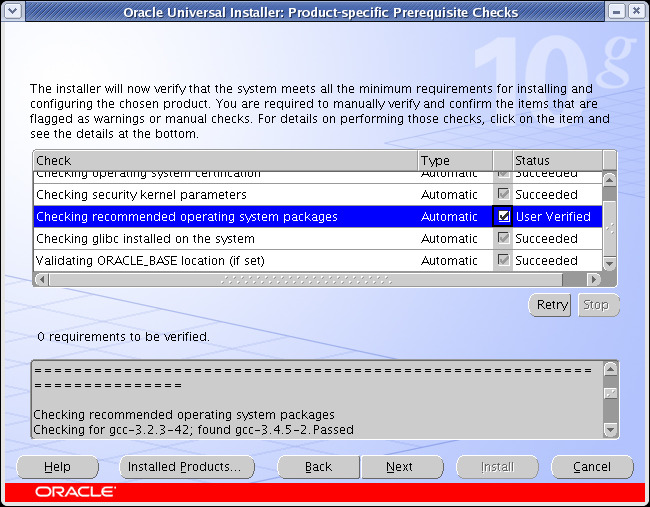 Screen 3: Select Product to install – If you remember for infra tier installation we selected second option, i.e. “Oracle Application Server Infrastructure 10g”. 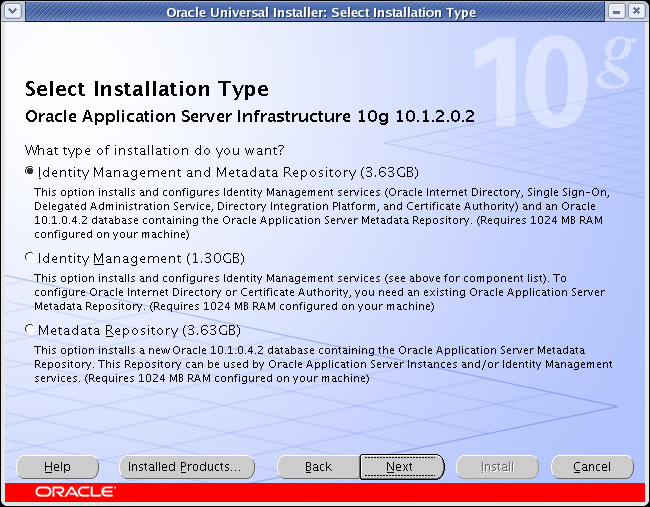 Here we have to install mid-tier, which will be present inside “Oracle Application Server 10g” option. 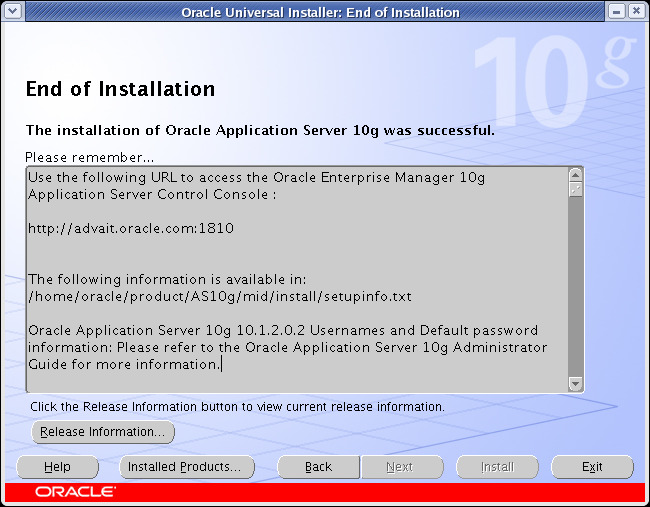 So select “Oracle Application Server 10g” option. Screen 4: Select Installation Type – Here you can select the required installation type depending on the components you want to install. For this installation we will go for Portal and Wireless. Screen 5: runInstaller will perform the basic check on operating system. If for any of the check it generates warning, you can verify the same using the check box and then click on next. Screen 6: Pre-Installation Requirement – You should have root privileges as you need to run root.sh after installation. Select the checkbox and click on next. 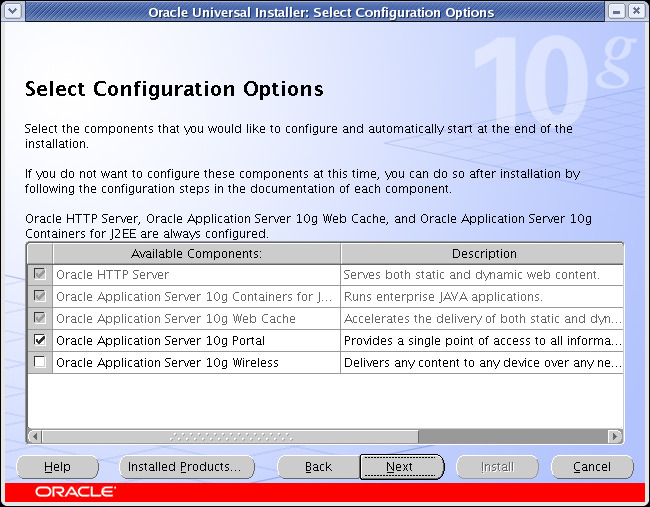 Screen 7: Select Configuration Option – You can select individual components which we are going to install. Screen 8: Port Configuration Option – For Port Configuration, select Automatic port selection to keep installation simple. Else you can specify the ports in staticports.ini file and upload the same. Screen 9: Register with OID – Here you need to provide the hostname and port number of OID which you have already installed as a part of infra tier. By default the port number is 389. You can also check the port numbers of infra tier by going to ORACLE_HOME/install directory and checking file portlist.ini. 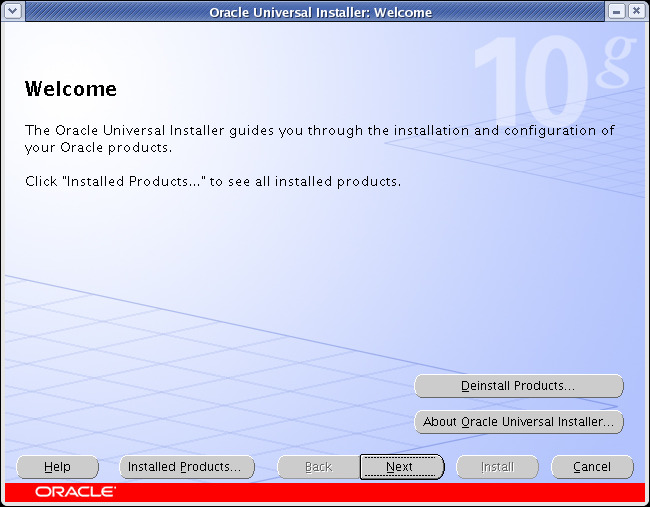 Here ORACLE_HOME refers to infra ORACLE_HOME. 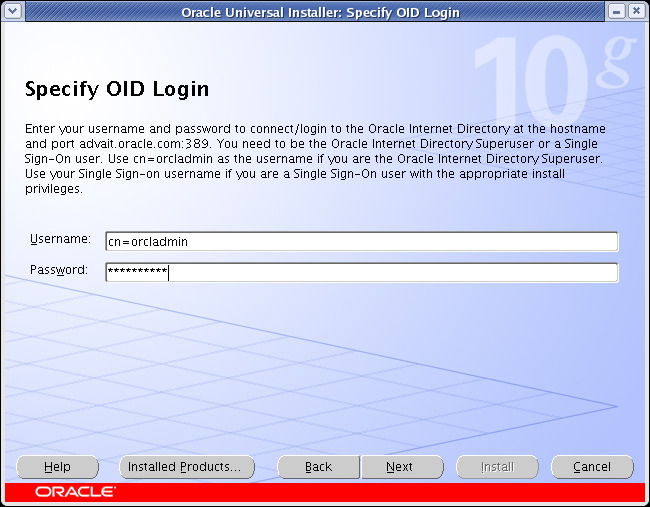 Screen 10: OID Login – Here OID superuser login should be given. by default its always orcladmin. You have to give the password for this user. This password will be set for orcladmin. You can give any password. 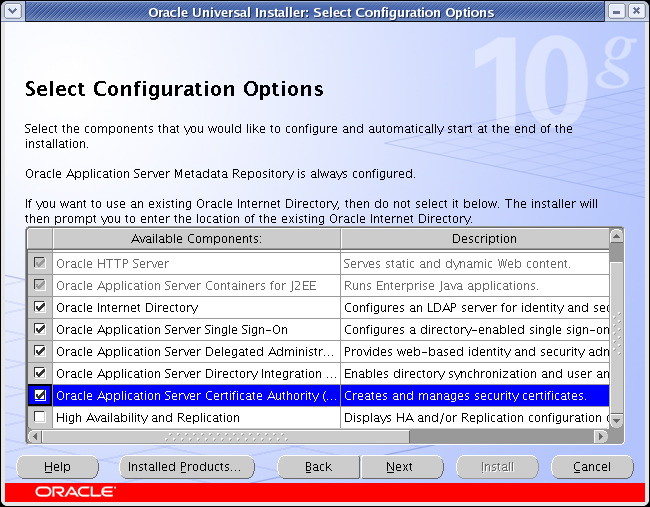 Screen 11: Select AS10g Meta Data Repository – This will show the name of database that we created as meta data repository as a part of infra installation. Screen 12: Specify Instance Name – Here you will specify the name of the instance that needs to be created for mid tier and also the admin password for logging into EM (Enterprise Manager). Screen 13: Summary – At the end it will show summary. Click on install. You can see the progress of installation. After this initial copy and setup, it will start configuring each components one by one as shown below. At the end it will give the URL for enterprise manager and port details. You can access enterprise manager to manage Application server. I don’t want to extend this post more now. This completes the installation. More details will be provided in next posts. Thanks. I am not able to enter the oid username “Specify OID Login” screen. if i select the default one..then its saying username is not found. Its very good doc now my confusion is out. 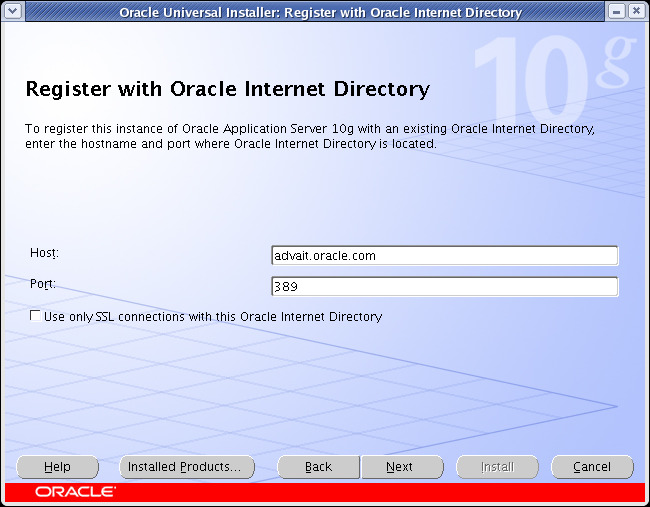 i’m ready to install AS10g on R12. I’m not ready to install . 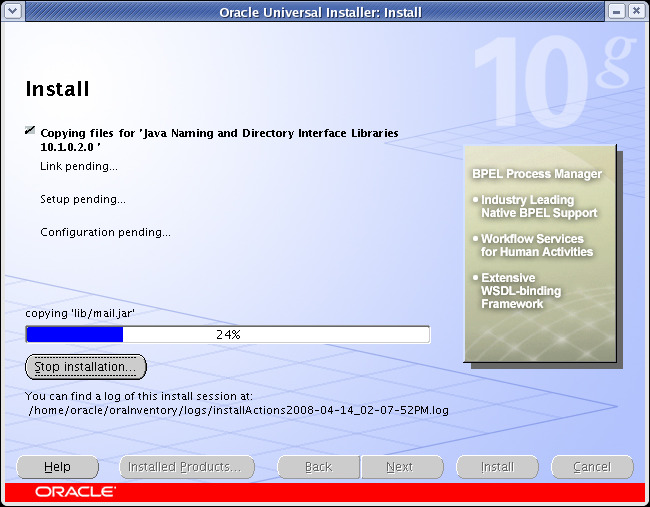 I want install without database. Nice documentation, last day i tried to install but lot of confusions, now i got some picture of installation. 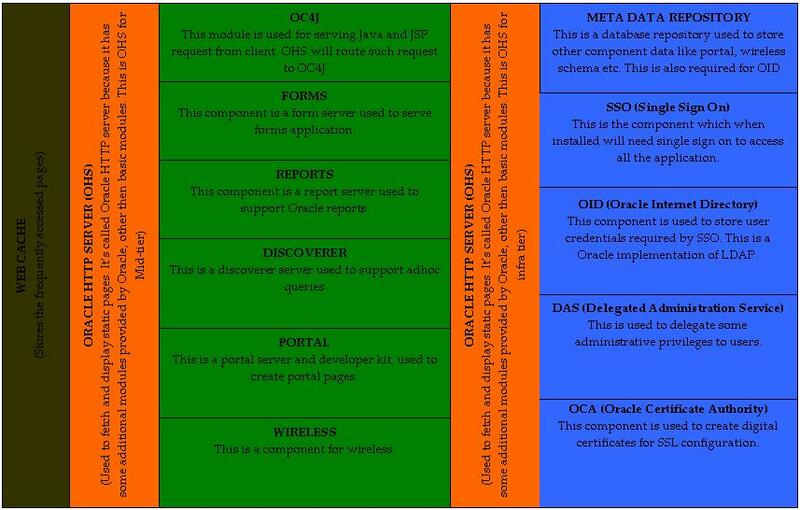 Can you provide me the Oracle 10g AS architecture diagram, so that i can understand much better and have a deep look towards it. 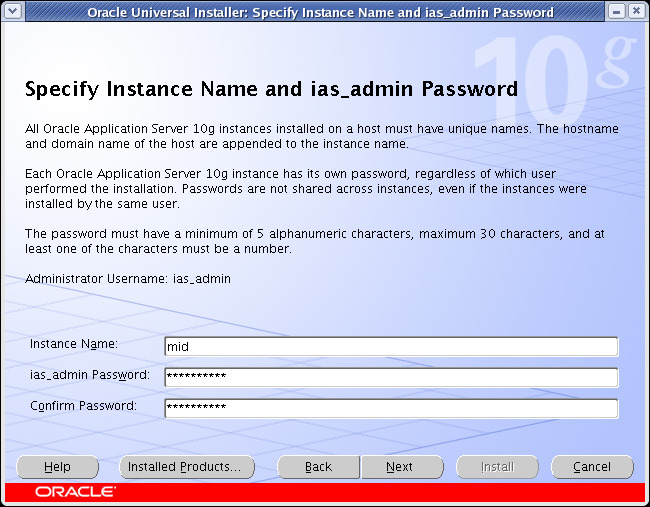 I am not sure, how you want to connect the AS 10g installation to the existing database. 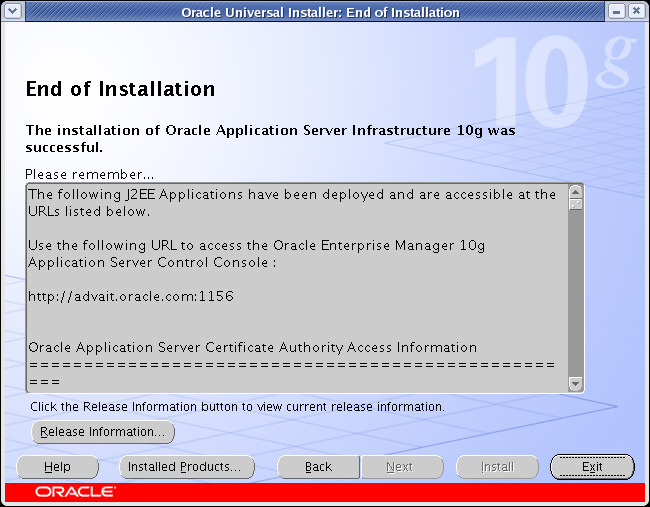 When you install AS 10g (Complete installation including BI Forms), it installs infrastructure tier as well, which has oracle database. For products like OID, SSO, Portal etc which is installed, it uses this infrastructure tier. 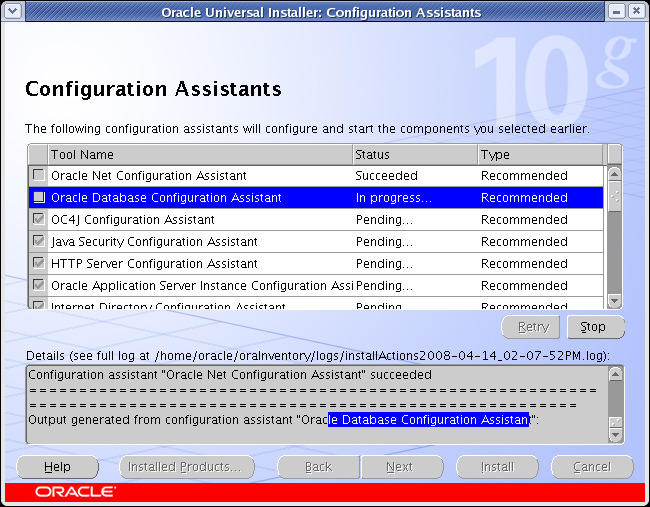 If you have a standalone database, I am not sure how to connect oracle 10gAS with that database. However, if you have an existing “Infrastructure tier”, you can point your AS 10g to that infrastructure tier. Hello. I hope you can help me on something that is happening to me. I am trying to install the infrastructure of Oracle Application Server 10g R2 on Windows Server 2008. 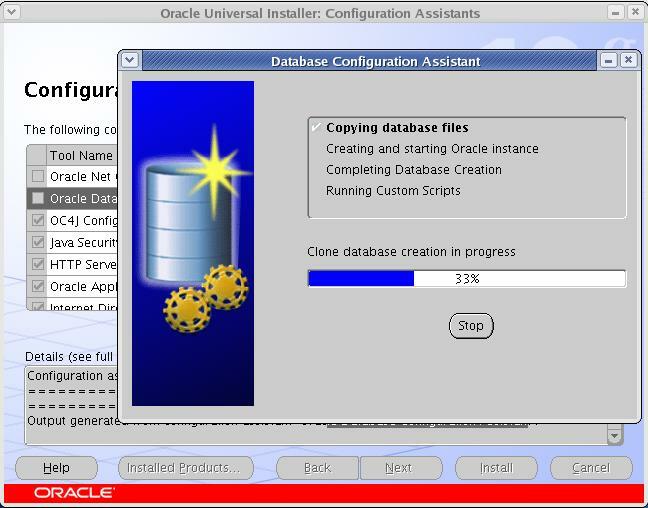 Installation is normal until install the database, there occurs an error associated with Oracle LISTENER and error is emitted with APPCRASH windows and associates it with ORACLE.EXE. It will be a security problem or what else could it be? Really Thank you for this post, I appreciate it. Very Nice Info. I will be really thankful if you can post a similar graphic demo for deploying oracle forms and reports using Application Server console or other.